“Well, you never were a real Christian.” I sometimes hear this from pious folks who can’t process my transition from Methodist pastor to atheist. They know that their ‘walk with the Lord’—their personal relationship with Jesus—is so authentic. They’re pretty sure I never had that. And they’re right. I believed in God and I knew that Jesus was his son, but it was alien, under my mother’s devout tutelage, to speak of ‘having a walk with the Lord.’ Nor did it occur to her—no matter how sincere our prayers—that Jesus could somehow be a pal or friend. Perhaps my atheism is easier to explain since I failed to make that personal connection with Jesus; atheism is impossible once that has happened. Because Jesus is so real. But sometimes it’s the folks who know Jesus best who take the hardest falls—and live to tell the story with passion, eloquence, and heart-rending honesty. 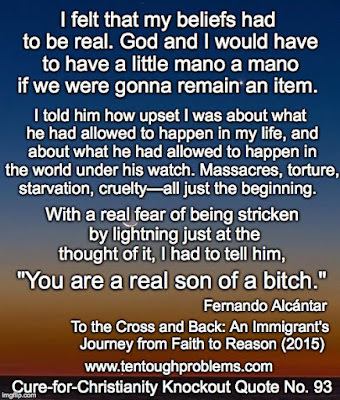 This is the case with Fernando Alcántar’s 2015 book, To the Cross and Back: An Immigrant’s Journey from Faith to Reason. 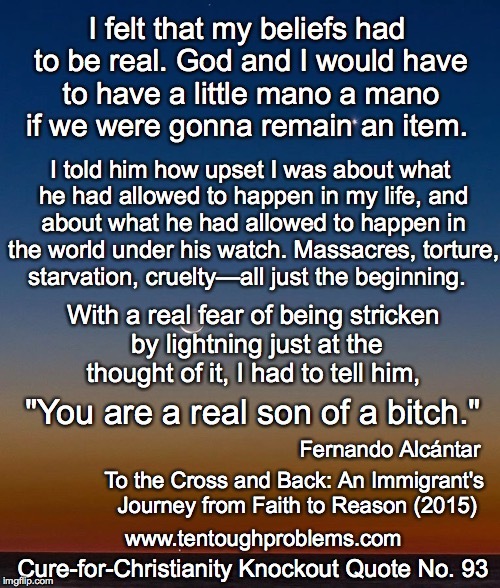 As we read Mr. Alcántar’s story we appreciate how much damage religion does, but that people can bounce back. We are relieved that he ends his account on a positive, upbeat note. He is a survivor, with amazing insights into the forces that drive humans to embrace religious fantasy. Alcántar’s journey included immersion in Catholicism, Pentecostalism, United Methodism, among United Methodists who were savagely jealous of that identification. This amazed me, since I grew up a Methodist—and yes, the Wesleyan tradition offered a certain mystique—but United Methodism was a product of merged bureaucracies. Why be fiercely proud of that? Alcántar’s felt the sting of being an outsider (Christians being mean to Christians), and he also served a tour of duty in that brutal American theocracy, Mormon Utah. He was an employee, not a member, and suffered for his status as an enlightened outsider. Enlightenment was not an asset. This brought to mind one of my own teenage moments of doubt, sitting in church in rural Indiana. We were praying, singing hymns, listening to sermons about God…but how do we know there’s really anything there? Alcántar and I both sensed that God isn’t all that obvious. God-knowledge has to be pounded into us, and reinforced relentlessly, every Sunday. That shoulda been a clue. And yet we pursued the religion thing. “…I also cried for the pain I had buried since I was a child. I was raised fatherless. I had always been marginalized, made fun of, for being different. And even as that little child, when choice was taken from me, my small and tender body was used by the despicable to satisfy their desires. But he wasn’t out of the woods. During one sleepless night Alcántar recounts: “I swung my legs off the bed and got down on my knees. I looked out the window and sought His face in the night clouds. My hands up in the air, I begged for His attention.” But he had been through so much pain in his young life, too much for a magic Jesus to wipe away. • There is no way that God would’ve been waiting all this time, letting people die, be tortured, suffer, just so some college students would raise money and go help for a few weeks to provide for needs they are incapable of fulfilling. The immensity of the international austerity is so vastly overwhelming that the selective and delayed engagement of a living God has to be questioned! Where the hell are You God?! People are being torn to pieces as we speak—and they have been for centuries. • And how is it possible that is All-Powerful God would be limited by the limitations of humans He created and could destroy at any moment? It’s madness to believe that He’d let people be tortured by human hands or natural disasters because he is “waiting” for the right time or the right person. Excuse me?! “The right time?” “The right person?” Are we saying that people in pain are pussies for not holding on a decade longer before succumbing to the grave? Are we saying that God is not powerful enough, or even worse yet, not willing enough to have done something in hundreds or thousands of years to “orchestrate” goodness. I was mad as hell. Alcántar could not, after all, tolerate God’s procrastination: we want things to make sense now. The retreat to “god’s mysterious ways” to account for suffering is a dodge, a wild guess, giving the finger to reality. Believers bristle at the notion of “the god delusion,” but the way Christians have set up their monotheism, well, sadly, there is no way to evade the contradiction of a loving god who doesn’t care enough. Alcántar’s book is a powerful affirmation of humanism that can emerge after an escape from fantasy. It is especially valuable because he describes so vividly the tragedies and traumas that he has survived, e.g., the accidental death of his step-father—a truly harrowing story—and his own close brush with death from a fall. We find ourselves in the presence of a master storyteller who has made a fine contribution to the growing library of works by ex-Christians who have valuable stories to tell—to make the world a better place. Better, of course, means the reduction of racism, misogyny…and homophobia—three of Christianity’s biggest sins. Thus, for me, one of the most poignant sections of Alcántar’s book is his account of coming out to himself as a gay man. I’ve made that journey myself, and so his description of that process—which is unique to every person—was especially moving. “Everything in my life was attached to religion. It was my life and, because of that, I felt that my beliefs had to be real. God and I would have to have a little mano a mano if we were gonna remain an item.